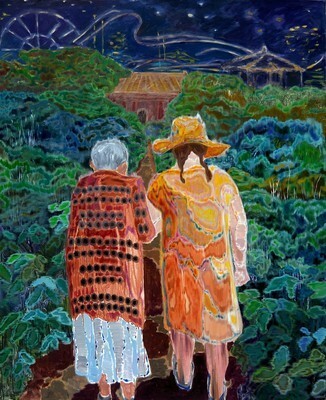 MARC STRAUS is pleased to present our inaugural solo exhibition of new paintings by Utah-based Chinese artist Xi Zhang. The exhibition opens Friday, February 16 from 6pm – 8pm and then will be on view through April 1st, 2018. Cultural identity and immigration are the most decisive issues of the day in international politics; frequently breeding conflict and misunderstanding. 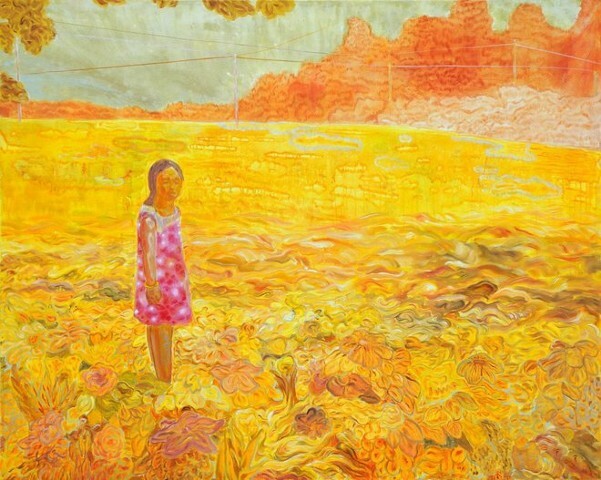 Zhang has tackled these subjects for almost a decade, having studied painting both in China and the US. His new paintings more poignantly than ever bring insight and balance to these heated subjects. His expressionistic canvases present elusive narratives: who are these characters? where are they? The oneiric environments are manifestations of their inner anxieties and dilemmas, places in-between dream and reality, where forbidding landscapes and atmospheres engulf the protagonists. They reflect the immediacy of the issues at hand, that the physical and psychological struggles are real, and pressing. Visually, they are arresting-loud, vibrant colors amplify emotional depth. Conflating styles of the East and the West, Zhang’s work echoes water-colored landscapes of antique Chinese scrolls, but also the expressionistic gestures and exuberances of early 20th Century Germans and the Italian Transavantgarde of the 1980s. 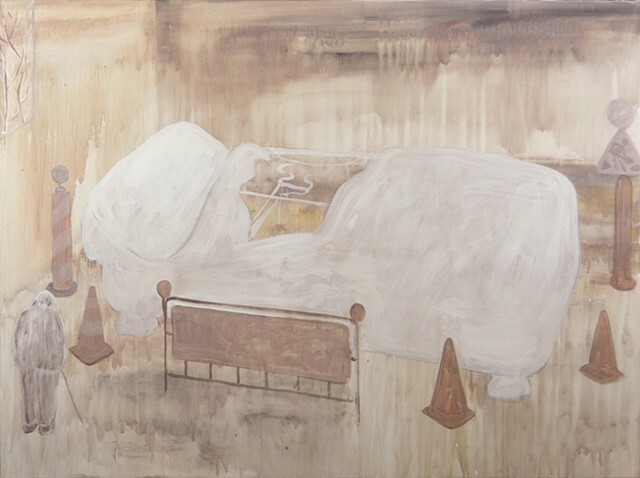 In his painting The Castle a blind boy ambles across the surface of a luxuriously large bed. It is a place of affluence with well-appointed furniture and large architecturally impressive windows; and yet the foreground is overgrown with wild foliage. Entropy is quickly breaking down the productive bubble. The blind resident is oblivious to his precarious position, an apt metaphor for the modern moment, where wealth may provide an illusionary place to retreat from looking at the wider world. Christina’s World relocates Andrew Wyeth’s iconic character from the idyllic American heartland to a harsher shanty town. Piecemeal shacks are crumbling in the background, while Christina stumbles through a fallow landscape of dead trees and refuse. Toxic green ground and orange skies drive home the mental trauma of the setting. The exported American Dream is forced to be reconsidered with shocking contemporary realities. Yet, Zhang is not a pessimist &#9472; his narratives remain open; there is beauty and hope within. For Zhang a brighter future is always possible but requires sincere acknowledgment and apprehension of current obstacles. Born in 1984 in Kaifeng, China, Xi Zhang completed his studies in painting at The Beijing Institute of Art and Design. He moved to the United States and received a B.A. in painting at Colorado’s Rocky Mountain College of Art and Design in 2008. That year the Denver Post recognized him as the “Emerging Artist of the Year”. He received an M.F.A t the University of Colorado, Boulder, in 2011, and was named one of the “12 Best Colorado Artists Under 35” as well as one of seven “Pathfinders” in the arts in the Denver Post. His 2011 commission from CNN elicited millions of enthusiastic responses on the channel’s website. He was a finalist for the Celeste Prize in 2017. "Xi Zhang was born in China and studied painting at the Beijing Institute of Art and Design. He then moved to Denver to study at the Rocky Mountain College of Art and Design, where he graduated in 2008 with a Bachelor’s of Fine Arts in painting. 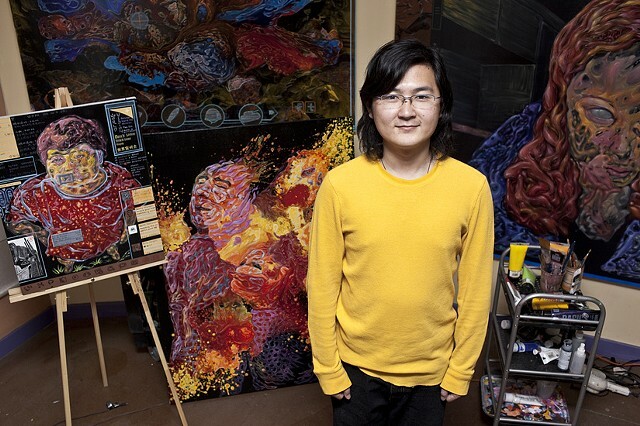 His work combines the world of pop-icons with technology and other resources to create works of art that highlight American hybrid and Chinese culture under the impact of globalization and technology. You’ll find his paintings to be vastly detailed, with winks and nods to many pop culture and historic icons, all of which with a slight sense of whimsy behind them. Check out his work at Denver’s Plus Gallery where he is a regularly featured artist." In one of the most exciting developments of 2016, Plus Gallery artist Xi Zhang has been invited by prominent contemporary art collector and gallerist Marc Straus, to spend three months in New York City as an artist in residence starting in May. 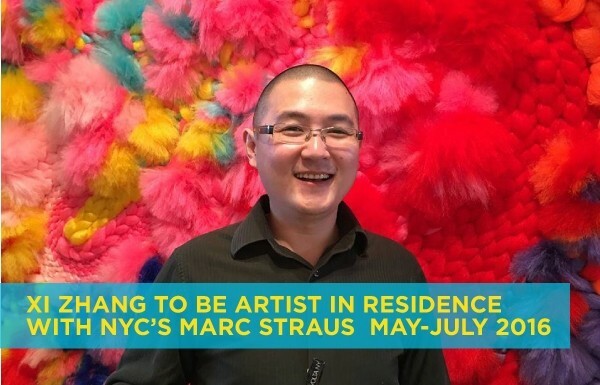 Zhang’s residency will be in connection with Marc Straus’ gallery located in the Lower East Side area at 299 Grand Street, currently one of the most booming scene’s within New York’s ever shifting core. Straus supports a first-rate stable of international contemporary artists, and, along with his wife Livia, is the founder of the Hudson Valley Center for Contemporary Art in Peekskill, NY, which the residency also intersects. The residency is a major opportunity for Zhang to obtain exposure in New York, and comes at the invitation of prominent art patrons of tremendous depth and community standing, whose collection has been the focus of nine separate museum exhibitions. The opportunity comes at an exciting and appropriate time for Zhang in his blossoming career. Plus Gallery is honored to have Zhang participate in a prestigious program with roots to some of the most exciting contemporary art in the world today. More updates to follow here as well as our Facebook page. 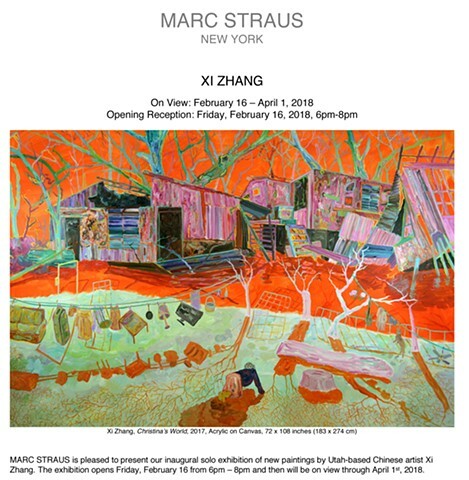 The Straus residency invitation straddles other exciting news for Zhang this week. 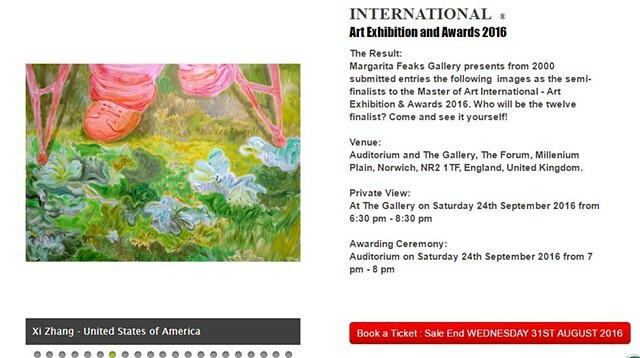 After three years of entering their competition, Zhang was officially selected as the Gold Winner in painting for Art Forward contest #5 “ Show and Sell.” The award is the top prize from a pool of 800 submissions, and comes with a full page notice for Zhang and the competition in this coming June’s edition of Blouin International Gallery Guide. The publication will be all over the streets of NYC during Zhang’s summer residency as well as the world at large throughout galleries, museums and institutions. 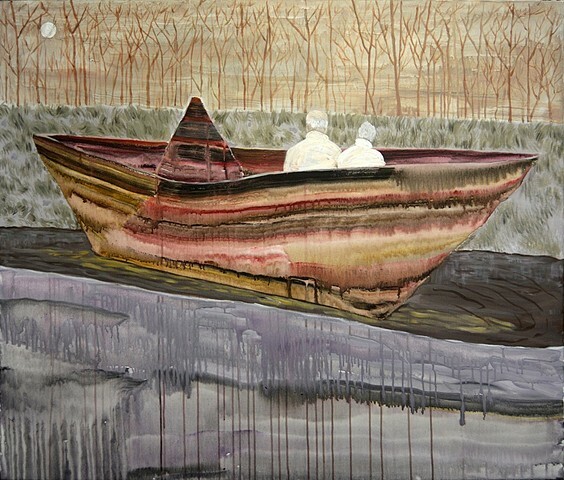 Zhang’s submission for the award was “Paper Boat,” one of his recent paintings from his ongoing Metallic Leaf Garden series, which has garnered him other prestigious placements and exhibitions including the current John Moores painting prize exhibition in China as well as the upcoming New American Paintings group exhibition at the Elmhurst Art Museum in Illinois, set to kick off in late May. Plus Gallery encourages everyone to support Zhang’s residency opportunity and burgeoning career by considering an acquisition of his work. 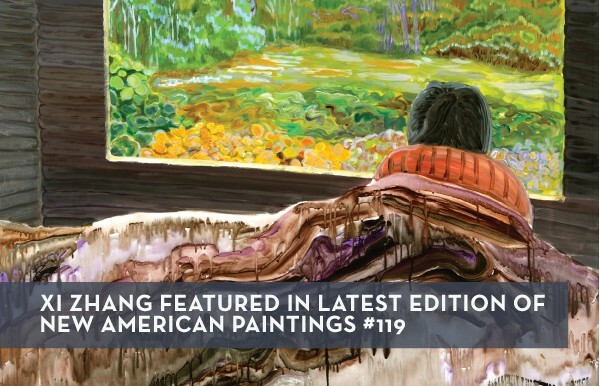 There has never been any doubt that Zhang is one of the most exciting artists to ever have emerged from Denver’s contemporary community, and will continue to be one to watch and collect in the future. 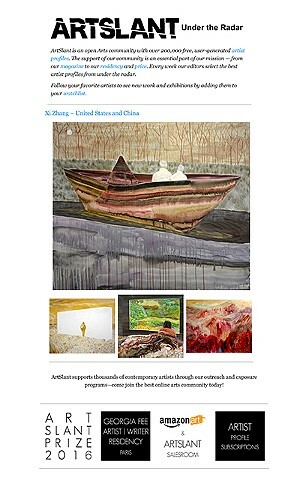 A reference to Zhang’s most recent paintings can be viewed in Plus Gallery’s most recent publication on Zhang at blurb.com as well as the plusgallery.com website. RARE Gallery is pleased to announce its participation in SCOPE New York, March 3 - 6. This year the art fair returns to 639 West 46th Street (off 12th Avenue) across from the Armory Show. RARE will occupy Booth #D9 on the second floor. To celebrate our 16th consecutive year of participation in SCOPE, we will be exhibiting Surrealist/Pop clock works by ClockWork Cros, exquisitely precise abstract paintings on paper by Colin Prahl, Symbolist-inspired mixed media collages by Patrick Seeley, and intimate, otherworldly figurative paintings by Xi Zhang. Please visit us at Booth #D9 to check out new works by these artists and to meet the RARE team. Feel free to contact Owner Peter Surace if you have any questions about the fair or any of our artists. Xi Zhang's first Milwaukee solo exhibition, Metallic Leaf Garden, will be at GreyMatter Gallery. Exhibition runs through August 29th. Through July 29. If you are among the throngs this weekend who will descend on the McNichols Building — headquarters for the Doors Open Denver architecture extravaganza — be sure to pop up to the third floor to see the artwork of Xi Zhang. The Denver painter is a rising star, and this high-profile solo exhibit might just be his unofficial breakthrough. The show, "21st Century DNA," mixes themes both human and political; the work is engaging and pointed and not what you would expect to see in a government-owned gallery. The artist will be in residence all day Saturday and giving a live demonstration from 11 a.m. to 1 p.m. McNichols, located at 144 W. Colfax Ave. at the north end of Civic Center, is open to the public 10 a.m.-5 p.m. Thursday-Sunday. Free. artsandvenuesdenver.com. Plus Gallery is thrilled to announce that Xi Zhang has been selected by the committee for Platform 5280, Denver's Biennial of the Americas, to be the official Denver participant and representative URRA, an Argentine artist residency program that encourages artistic production, favours dialogues, and promotes international networking. URRA will hold the third edition of its Artist Residency Program in Buenos Aires November 1-30, 2012, bringing together a group of 15 international visual artists for a month-long program where they will work closely with their peers, interact with the community, develop projects, and present their works. We are so proud to have Xi selected, his selection reflects not only on the high-level of engagement and success he's had within the Denver art community to date, but also sheds positive light on Plus Gallery as a vehicle for helping to build meaningful careers for Denver-based artists. According to the selection committee, "This project is an important step in achieving Platform 5280's goal to help Denver artists reach both local and global audiences." Platform 5280 will host a public Contemporary Arts Platform Presentation at 6:00 pm on September 28, 2012 at MCA Denver. Their contemporary arts team, international guest curators, and Biennial leader Abaseh Mirvali will present an in-depth look at the projects in the 2013 Biennial that will be activating Denver's public spaces. Certainly an event that we encourage everyone in the community to get behind. Xi Zhang was invited to give a "LOGAN LECTURE" at Denver Art Museum on October 26. Xi Zhang is featured in "Faces of Colorado Art"